UAH global satellite data has record warmest day for January | Watts Up With That? Many people think that the globe must be terribly cold these days. We’ve seen huge cold snaps and snowfalls in Britain, Eastern parts of the U.S., Western Europe, Central Europe, China, Korea, and India where hundreds of people have frozen. So these are almost all the important places, right? (At this moment, the speaker forgets that there are places such as Latin America, Australia or the Balkans which have been warm.) So the globe must be cool – cooler than average, people could think. However, there is another, more important consequence of these numbers. And it is the following: the global mean temperature is irrelevant for you and for everyone else, too. It didn’t help the hundreds of frozen people in India, the passengers whose flights were canceled, and millions of other people in the European, Asian, and American civilization centers. The Pythagorean average monthly anomaly in Prague has been something like 1.95 °C. Imagine that you want to use the global temperature in order to improve the estimate of the temperature in Prague for a given month. If you add the global anomaly and the expected local average temperature in Prague for the month, you will reduce the typical fluctuation from 1.95 °C to 1.92 °C or so – almost no change. The swings in the global temperature won’t visibly help you to improve the predictions of the local temperature. So while it may be fun to watch the global temperature – a meaningless game that many people began to play in recent years because of the AGW fad (and yes, your humble correspondent only plays these games because others do, not because it is scientifically important) – it is very important to realize that the changes of the global mean temperature are irrelevant for every single place on the globe. They only emerge when things are averaged over the globe – but no one is directly affected by such an average. Even if you accumulate a whole century of changes, the relevance of the global temperature will be essentially non-existent. A 1.5 °C warming of the global mean temperature is still less than one standard deviation of the monthly average at a given place. And the “local” climate may also shift – the January 2100-2150 average may be warmer than the January 1950-2000 average in Prague by much more than those 1.5 °C. Different regional climates change differently and most of these changes have nothing to do with the changes of the global mean temperature! By the way, it’s almost certain by now that January 2010 will also be the globally warmest January on the UAH record – the anomaly will likely surpass 0.70 °C. It may even see the highest (or at least 2nd highest) monthly UAH anomaly since December 1978. I will print more exact predictions in a week or so. I seem to remember that Dr. Spencer has warmed us in the past to avoid UAH daily data due to corrections that were applied only on a monthly basis. I also remember him saying this would be changed sometime *soon* back in August. Has the time arrived? Can we now look at daily data? Are these Land-based Temperture readings or Satellite? TIA……John.. So are the warmists predicting more earthquakes? So iguanas dropping from trees and the lack of feeling in my fingers and toes was because of the heat? That’s a relief. Sorry I don’t get it, a global mean temperature of -16.36 deg C ? Given that 70+% of the surface is ocean, how can the global mean be way sub zero ? Excuse my ignorance, but if the graph is of a global temperature average, how come it follows a northern hemisphere pattern and is warmer in the northern hemisphere summer? What is important about the cold January in the northern hemisphere is that it will cool the planet going forward. The albedo effect of the large northern landmasses covered with highly reflective snow is gigantic. The earth is right now reflecting away a significantly larger fraction of sunlight than normal. People like Stephen Chu talk about the cooling effects of white roofs. Well that picture of an all white England–replicated across Europe, Asia and North America–will if it holds out for month create a thousand times more cooling than a hundred years of white roofs. That is true for a given planetary temperature, but it is not true going forward, where planetary temperature can change. All it takes is for outgoing radiative energy to exceed incoming radiation, and albedo is a big part of that equation. Yes, Spencer did say to use *only* the previous year for comparison on the Explorer site. Just by looking at the past years it is easy to see that this spike will drop by the end of the month. I do not see any spike in temperature that has lasted more than two to three weeks. Most likely will end up only half of the .7 C anomaly by the end of January. Land temperatures have not been warm in January. It is unlikely that GISS or Had-Crut will show the same spike. Is the raw data for this satellite audited by anyone? Update on my analysis. If you plot the number of days above 30C (dropping) vs the number of days below -20 (also dropping) vs the length of winter (increasing) plotted together on the X axis and plot the average mean temperature on the Y axis you get a line where the correlation coefficient is -0.84 and a P value of essentually zero. This means the average of the mean temperature is highly negatively correlated to cooler summers, shorter warmer and winters. Thus increasing the average mean temperature. The data from 1921 to 2006 shows three clear phases of changes. 1935 to 1955 a decrease in the number of hot summer days by half, from 1956-1985 stable summer temps, and 1986 to 2006 an increase in summer days above 30 but still well below the first phase. During that time the length of summer has increased linearly where we now have 30 days longer summers than we did in the 1920s. During that time, the number of days below -20C has been cut in half in a linear trend. I’m willing to send the preliminary results and data to anyone who requests it. This is a very poor correlation. Basically, there are no correlation. The whole notion of warming could be thrown out… with the water too. Speaking of UHA Roy Spencer did a recent article featured here. In that article Roy said this…. This appeared to me to be very important, and very vauge. Do snow surfaces give a false high, or low reading? Does this increase the margin of error. Would the recently very high % of N.H. snow cover significantly effect these readings? And finally, What does the last sentance mean in regard to the oceans, 70% of our home. Someone with understanding please respond, and thanks in advance. Yesterday’s annular eclipse must have cool down the earth a little since it was the longest eclipse for more than 1000 years. If the warmists are trying to convey that as meaning land, they are once again resorting to half-truths. 2/3 of the world’s surface is ocean, not land. So, there is a 1 in 3 chance of that happening. Having a disproportionately large area of the N. Hemisphere snow-covered reflects back into space the incoming. The oceans would be the warmer part, and they would be the ones losing on the deal, giving up thier stored energy in the imbalance, for the flow off the continents is colder. Upon hitting the relatively warmer oceans, they readily take up the warmer moisture. The clouds formed will continue to rise in unstable air masses until they precipitate the water out, and the heat escapes. Oops, there goes the heat: Less received by the snowy landmass and more pumped out of the oceans. The sea temperatures don’t vary as much as the land temps do, and the curve there is really only the top of a chart that starts at absolute zero. Keeping that in mind, the variation is less than 1½ % . The UAH daily data is brightness temperature ie the calculated temperature of a black body emitting the same radiation as measured. The true temperature can only be calculated if the emissivity is known. As long as emissivity is constant a trend of brightness temperature will follow the true temperature with a constant displacement. When emissivity varies problems arise. If the emissivity is rising with constant true temperature the UAH data will show an increasing brightness temp and warming. This is possibly what is happening at the moment with all the snow and ice around. Is there a colour key for each of the lines plotted on the graph? And I am finding a global average which varies through the year between ca -18C and ca -14C rather difficult to get my head around. What has that got to do with average surface temperatures? These readings must be +25,000 feet high. Surely this does not correlate with the monthly UAH surface figures? Note that the 1km altitude measurements showing the most rapid increase were discontinued for some reason. I’m sure it isn’t to hide the incline! The reason for discontinuing this measurement would be of interest. Formation of snow requires removal of heat from water vapor in cold air. That heat remains in the air. The snow drops to the ground. The atmosphere where the snow fell now holds the snow’s latent heat of freezing and, though it is still cold, it is “warmer” than it would be if there had been no snow. Got it? I blame Australia for it. It was rather hot there. There is also a large hot spot in the South Pacific nearly as large as Australia, with a temperature anomaly peaking at +4 degree C.
Remote Sensing Systems (RSS) of Santa Rosa CA also interprets the satellite temperature data and publishes a similar product. UAH and RSS independently produce very similar results. Worldwide averages are largely meaningless to a world where the majority live in the Northern hemisphere. The average punter’s weather memory is about six weeks and all events after that time are amplified or diminished depending on the nature of the event. That’s why it was so easy to peddle the myth of AGW. Would the thinning of the ionosphere could have an effect of the global mean atmospheric pressure that could in return affect the temperature readings (i.e. gas compression)? The ionosphere must exert a certain pressure on the atmosphere since they don’t just float away in space…. Maybe there was a big sea of plankton when they measured there that day. My recollection is that the MSU is more sensitive to El Niño (98 spike larger than surface) so it would seen reasonable. The satellite temperature sensing method is clearly far superior to the compromised record from surface stations but I am concerned about our current ability (or rather lack of such ability) to interpret the results accurately. I think we need a number of years during which we must observe how the satellite readings vary as a consequence of changing real world climate events. The issue of an increased brightness from more snow cover possibly giving the sensors a false temperature reading is but one of a number of ways that the satellite results might be skewed away from accuracy. The issue of cloud cover and variations therein affecting planetary albedo is another such problem. Additionally I consider that what matters most is independently variable energy flows between the multiple layers of the Earth system and the fact is that if the net rate of energy flowing through the system varies for any reason (not just CO2 quantities) then the satellites can be misled. If energy throughput slows down the satellites will detect a cooling because less energy is being released to be measured by the satellites but at such times the total energy in the system is actually increasing i.e. the opposite of what the satellites tell us. If energy throughput increases then the satellites think the globe is warming but in fact the total energy content of the entire system is declining. We are only at the beginning of interpreting the data correctly and we can expect many false interpretations before we can accuratelty appreciate the proper drift of real world climate events. For me the best climate diagnostic indicator for the troposphere is the net latitudinal position of all the global air circulation systems combined. If more poleward than the seasonal average then the troposphere is warming. If more equatorward than the seasonal average then the troposphere is cooling. However as the troposphere cools the oceans and stratosphere can be warming and vice versa. The troposphere may just be a ‘passenger’ or possibly a ‘filling’ sandwiched between other processes occurring in oceans and upper atmosphere. We need a much better grip on the variability of the energy flows from oceans to troposphere and then from the troposphere to the higher levels of the atmosphere. Aren’t global tempertures just a bogus concept based upon bogus data? When the current interglacial ends and the next ice age starts, it will be interesting to see if global temperatures, as currently measured and defined, increase. Someone correct me if I’m wrong,but in this context “warmest January day on record” actually means “warmest January day since 1999”. There is no daily data for January 1998 or earlier. I think Gary’s (14:13:47) comment raises good points. For typical Earth atmos temperatures, the Earth as a black body is a poor assumption. All sorts of erronious signatures from emission spectra of stuff will have to be accounted for. A new record means something, but what? Unless I’m missing something, the black body measure is a poor proxy for temperature. Why even consider it when there’s better measures available? What gives? Something smells in Denmark, to coin a phrase. We all know the northern hemisphere has been the coldest in many years during early January. The stories abound everywhere (I in S. MN. on the Iowa border have yet to see the temperture above freezing this year and spent most of the first two weeks below zero F). Now as us sceptics (realist) are gloating. It just so happens the people behind the curtain, come out and say we just had the warmest January day in recorded history during the fridged plunge? Well excuse me, I wasn’t born yesterday. I would like to add I found this site http://data.giss.nasa.gov/gistemp/station_data/ I typed in my local rural city and asked for raw data graphed since 1886 (real temp data I assume). Anyhow here is the result http://data.giss.nasa.gov/cgi-bin/gistemp/gistemp_station.py?id=425744400040&data_set=0&num_neighbors=1 Amazingly their is not any Hockey Stick My city is as cold as it has ever been in rfecorded History! No wonder I do not buy into the GW frenzy. I am a Farmer and would wish it would warm up so I could consitantly raise better crops…….John…. 1. It is not possible to measure the temperature of the Earth and it is a fraud and a pretence to claim otherwise. 2. Claims about hottests days, weeks, months etc are meaningless. Even if totally accurate the satellite data only tells us something about the last 3 decades. The ‘adjusted’ ground data is a complete joke. Monitor melting land ice to gain advance warming of any danger of sea-level rise. Monitor rainfall trends in desert margins to see if desertification is spreading. 4. Give up on calculating and publishing anything but local series of temperatures to decimal points. This is false precision. You cannot multiplying approximations and averages together and claim exactitude. It is scientific and mathematical nonsense. Maybe it’s better to produce 3 charts — northern hemisphere, tropics, southern hemisphere — instead of just one, the global average, for daily or monthly satellite data. That way, those in the NH won’t be confused by “warmer” days when they are freezing because the average was pulled up by hotter days in the SH. Reply: I’ve read where the average (again, a useless term?) temperature of the earth during a glacial epoch is supposed to be the same as an interglacial like we’re currently experiencing. If so, that would require the lower latitudes to heat up and the higher latitudes (poles) to cool down to maintain the balance. This would cause increased evaporation and snow deposition, hence the preponderance of ice during a glacial epoch piling up at the poles. I’ve also read where weather patterns become extreme just before the next interglacial sets in, which is a rather sobering thought considering all these extreme weather patterns we’re hearing about. But the question remains–are they really any worse than, say, 50 or 100 years ago? We’ll just have to wait and see. I fear climate scientists will be so busy trying to find the incline (while at the same time hiding the decline) they won’t see the next interglacial coming. They’ll be up to their necks in summer snow before they know what hits ’em. 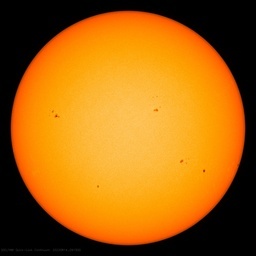 According to the “World Climate Widget” sunspots are up and solar flux is up. And Jan 13 was a record warmest day for January. Between sunspots, flux, and temp, is there a graph or something confirming which increased first? Since 1979 their have been about 10 MSU satellites, each has a life of only several years, so the 30 year record is from a number of different satellites data seats where intercalibration and inter-satellite biases are an issue. The main issue with early satellite data with the warmers is that the results were showing results that were too cool. These “systematic errors”, including satellite decay issues, calibration issues and inter-satellite biases have resulted in a lot of tweaking and corrections to the data sets, resulting in you know what, warmer temperatures converging with surface trends and GCM models. From Christy et all (2007) since 1992 the UAH LT data set has been revised on average about every 2-3 years. They should dump that “near surface” jargon, 14,000 ft is near surface only for planes and birds. The density of air at that altitude is low enough that temperatures become less meaningful when we are talking about heat or warming. Also, I would think more lower cloud cover could influence the temperature above these clouds, while below the clouds it is cooler. Anyways, satellites are great, but they have some issues as well as recent posts have shown. It wasn’t until I learned more about surface measurements that I became a skeptic. I am getting that deja vu feeling with satellites, if you know what I mean. Who controls the calibration, algorithms and adjustments control the past and present and of course controls the future predicted by models. It appears that daily data is available since about day 320 of 1978, but the chart above does not appear go back far enough to include the huge anomalous temperature spike of 1998. This is based on a quick look at the uncommented and unlabeled source data files. Hey, I live on an island off the coast of maine if this is a warm january I am going to have to close my eyes when I look at the ice forming across the bay where the ferry lands. Up in terms of sunspot numbers is a relative term. Up from what is the key here: The bottom was very, very low and long. We are back to where we should have been 2 year ago…. before dropping into the basement. There’s plenty of ground left to make up before reaching levels corresponding to ‘warming’. One poster in another thread put up a monthly sunspot number as being the break-even point. I have not seen anyone else do that or recall with certainty what that number was. Maybe 40…maybe higher. I think you’ll find that the satellite data seeks to measure and then invert the radiances across the entire measurable spectrum. The method for extracting temperature should not and does not assume a constant emissivity. For example, if Earth’s albedo increases because of snow cover (or increased cloud reflection) with zero change in average temperature then one expects a disproportionate increase in outgoing SW radiation with little change in LW emission. A temperature change with no change in albedo should increase radiance across the spectrum with a (predictable) shift in peak radiance. Thus, while the temperature interpretation is indirect and will always be prone to some error, I have not read anything in the literature that would suggest a systematic warm bias in the event of increasing albedo. If anyone else has, I would appreciate a reference. … The true temperature can only be calculated if the emissivity is known. As long as emissivity is constant a trend of brightness temperature will follow the true temperature with a constant displacement. When emissivity varies problems arise. If the emissivity is rising with constant true temperature the UAH data will show an increasing brightness temp and warming. This is possibly what is happening at the moment with all the snow and ice around. From this one would estimate that the data would show a false high reading due to the increase of snow on the ground. ??? Is this quantified. How much does this affect the margin of error? Other posts indicate the amount and reflectivity of the clouds can effect the readings. Can or does? and again how much? Got it. But… when the snow melts in the spring it takes the same amount of heat to melt it as it gave up when it turned to snow? Result being “cooler” than it would be if there had been no snow and netting to zero? Unless the snow lands some place far enough north or south that it never melts? my head hurts from thinking about this? Yes, the spring will be the reverse situation (except the snow may run off as it melts, instead of requiring heat to evaporate it locally.) The net will not be zero, though, since the winter albedo during heavy snow accumulation was raised, thus cutting the heat input to the system. Remember, too, that flow of heat from the NH to the pole, as has occurred this winter, also increased heat output to space. Less heat in, more heat out -> global cooling, net. Global temperature is not very meaningful. The ocean is almost 1200 times as large a heatsink as the atmosphere. Think of that! That’s a pound of air for every half a metric ton of ocean. Air temperature changes are transient and insignificant in comparison. This really doesn’t matter because the idea of a “global average temperature” is a complete fiction. Nobody believes any more in kool-aid powered satellites, launched from Hollywood launch pad. Or is it because of “positive feedbacks” from the GISS office in NY? This is surely true (maybe even understated), but does it really refute the relevance or significance of a global mean temperature? The global mean has its own standard deviation, and that ought to be the basis for determining whether or not it is changing significantly over time, not the standard deviation at a given place, which will always be much higher. I think a perfectly good analogy here is to the stock market. The standard deviation of a market index, say the DJIA, will always be much less than the standard deviation of an individual stock price. So? That doesn’t make the market index meaningless as a measure of aggregate market activity. So why does the higher standard deviation of temperature at a given place make meaningless the global temperature as a measure of aggregate, world wide, climate change? There may well be good reasons, from a physical point of view, for questioning the meaning of a global temperature as a metric for monitoring climate change. But not from a statistical point of view. The real bottom line here is that we happen to be in a “warm phase” globally in the decadal oscillation of global temperatures, with the rate of change in global temperatures rising since the latter part of 2007 (after the last La Nina). Think, then, what this means when the rising phase ends in the next year or two, and we enter the next decadal downturn. I’m making no predictions on how significant the downturn will be, but the current increase in rate of change will reverse (it cannot increase much longer), and we’ll get a period of “global” cooling. I don’t know if the cold this winter is the start of this downturn, or not. We’ll know soon enough, though. The answer probably resides in the tropical West Pacific, where the tropical rainfall is currently widespread. Those thunderstorms move energy from the sea surface into the troposphere, warming it. The storms will subside in a week or two and the temperature spike will drop. year. 2005 was the warmest year. and warmer in the Arctic. temperature to go up every year. At first I dismissed this as more alarmism, but since he is the guy who runs GISS I guess he had some inside information on what was happening. I still wonder though, how valid the Arctic sea ice adjustments are, and whether these are being incorporated into the January 2010 measurement. January heat wave, sorry but this is BS. USA also had a shity cool summer which NOAA somehow painted as warmer than normal summer. Orwellian double speak again. They are outright lying. Didn’t Hansen promise from 2010 onwards would be the warmest decade? Big interest are invested in carbon trading. It is obvious they will make a go for it, they have nothing to lose but lose. If the public buys such ridiculous “observed data” the slave tax will go through. If the warmistas actively publish that this has been the warmest January ever then it will surely do more to destroy faith in their alarmism. Even if they happen to be right. If global “warming” doesn’t affect the places people live, then what’s the problem? thanks for the explanation re snow melting. already had the rise in radiation from the poles figured out, been harping on it myself for a while, nice to see someone else mention it. Seems to me it is a pretty big negative feedback that the models don’t account for. TerrySkinner (15:41:19) – good points. Another issue that may be affecting satellite measurements is that I have read that the infrared blocking of CO2 is mainly in the 12 to 20 micron wavelength. This corresponds to the ‘hot body’ radiation at temperatures near freezing. So CO2 has a greater greenhouse effect (I assume in the upper troposphere) when there is a lot of ice and snow on the ground. This may be a source of distortion in the satellite measurement. I think the initial post was poorly argued and the commentary hasn’t been very helpful either. If, and this is a big IF as the data is very uncertain, this proves to be the hottest January on record, then it quite strongly suggest factor(s) that need to be quantified. CO2 and methane being two of them. With weak solar activity and strongly negative NAO I don’t think anyone in the sceptic camp was predicting the possiblity of an unusually hot January. Quite the contrary. Lubos Motl’s Non sequitur that “even if it is warming, it doesn’t matter” is simply a weak and faulty argument and strikes as ideological and not a scientific postulation. A 2C warmer world would have a clearly different climate compared to what we have today. The difference between medieval warm period and little ice age in Europe was possibly less than that. And it didn’t matter in the overal picture that during the medieval warm period you had a number of cold anomalies and during the little ice age there were warm anomalies. They were two distinctly different climates in Europe. In that perspective a 2C warmer world would be a very different place indeed. Whether for better or worse, I don’t think that is an argument we can answer with any comfortability due to huge uncertainties in how the warming would average coupled with huge global variation in how the weather patterns would change. So you can’t count out the possibility that a 2C warmer world could make for a lot worse living conditions for humanity. I don’t say it is likely but to entirely to dismiss the possibility is not rational at all. With this I’m merely saying that while it still seems logical to remain firmly in the skeptic camp, I think that at the same time the scientific position is to remain open to new information and to be ready to change your mind if the strenght of the measurements and arguments start switching to the other side. So this potential warm anomaly in a time of strongly negative NAO and weak solar activity is something we skeptics need to quanity and not to dismiss. These posts are not helping. I don’t care about the technical argument, stop being cute with the titles that have nothing to do with the point of the post. You have just confused the average person. This is like skeptical suicide. Here is a statistical beef. The temperature of a 10km^2 area can contain a standard deviation equal to 1.5C. How large is the finest resolution of grid box used in standard practice? Can someone help me out here? i was thinking (hopefully that’s not a crime yet) that what we should be looking at ony any given day is not the maximum temp but the difference between the overnight minimum and the previous day’s maximum temperature. this will show tha daily variance. then we look at the cloud cover levels for the area and over time we should be able to plot a graph that would show how much of the heat loss each day was stopped from the cloud cover , then the remainder would be what’s trapped by GHG’s and particles. Is there something wrong with that theory? It is interesting that the UAH global satellite data is so well insulated from the record cold here on the ground. If that is in fact true and not the result of manipulation, then there is no reason why anyone should be concerned about UAH global satellite data. It would be so much easier if our planet didn’t have any tilt, or any modulations thereof, and equal land mass placement. The Northern half would be the northern half and the southern the southern. Where do you draw the line on a tilted spacially imbalanced planet? Comparing Vostok and GISP2 the hemispheres DO NOT respond with the same amplitude or phasing to a given forcing (almost double in the NH)! That comparison implies that a global average WILL have a northern dominant component/trend. There is no average no? It would have to have a denominating line south of the equator. Does this global mean temperature refers to the top surface layer of the Earth’s atmosphere? Well, since the unusually cold air currently present sinks, the warm air due to the El Nino is forced up the atmosphere, thus we are getting higher temperatures at the top layer of the atmosphere. Is it so?? Actually I just went to the site (link in the article) and provided that you have java installed you can look at the data any way you want. Pick the layer and the years you want to compare, and press redraw. Now there is no doubt from the data that an over all increase is being shown over the ten years. But jumping on a 1 degree (F) rise on one day in January is misleading. If you turn off most of the other years so you aren’t looking at spaghetti, the first 9 days of January 2007 were WARMER than the first 9 days of 2010, so don’t draw any conclusions yet, the data isn’t all in. 2007 started out WARMER than 2009 for the first six months, but was cooler for the last six. All of which is almost as meaningless as the original observation of a 1 degree F rise year over year on a single day. Climate responds to input change in decades, perhaps centuries. Trying to discern a clear cause and effect out of 10 years satellite data does not seem reasonable. I agree, although my research involves Western Australia which is a long way from the South Pacific. November and December temperatures jumped sharply in most of Western Australia. January also has been above average so far. The same months in 2008/09 were below average. This is the official data (downloadable from the BoM site) charted via Excel. Actually the satellite has multiple channels at different layers. The one shown in the article is ch04 “near surface”. The highest channel they record is 118,000 feet. If you look at that channel, 2010 is “warmer” than 2009 so far, but cooler than 1999, 2000, or 2001. (2) the significant amount of tropospheric and in some cases stratospheric warming over the last month in the Arctic. Looking at the UAH_LT record, at least since 2001, temperature spikes seem to occur in January (’08 is an exception). I suppose it’s just coincidental. I still see cooler temps since 1998. Some say 1998 shouldn’t be counted because it was an El Nino year. So then the current warming from El Nino also doesn’t count? Thinking that average temperatures have any local meaning is like the guy who, knowing that the average depth of the river he needed to cross was only 2 feet, waded in and was promptly drowned in a nasty hole. Almost certainly there is some wide-eyed manic ‘scientist’ writing a paper to prove that earthquakes are caused by human activity in rich Western countries, the peoples of which must make grovelling apologies — and pay up. Once more, I suspect that the error in an average global temperature is much bigger than the anomalies shown. I suspect if a true propagation of errors was done on the plots shown and displayed with the nice curves, the error would overwhelm any differences. shows a large percentage deviation from black body ( sand is 75% of black body, water 95-96% etc). Suppose we take this 350watts per meter square that have to be radiated by infrared for the energy to balance, ten percent is 35 Watts per meter square, so how can one talk of a radiation budget to the accuracy of 1 Watt/m^2 ? As to the emissivity of the atmosphere , ( the percentage difference from black body) the gray body constant of air which can be calculated as in formula 8 in link and is temperature dependent: for 10C it is 0.74, at 20C it is 0.79. for 30C it is 0.85 introducing more errors. These errors can be of the order of 10% the transformation of temperatures into energy, and it is energy that is important. I really really would like to see those lovely AMSU plots have an error display. Maybe out of this fiasco of AGW one should come out with two separate measures. Temperatures are useful locally, for life on earth, and anomalies locally have a real meaning. That can be kept with the local thermometers very well. Satellites should stick to energy entering and energy leaving the earth in total. This will tell us eventually if we are warming or if we are cooling and sliding towards the next ice age. Is there such a satellite ten year plot of average total energy input -energyoutput in watts per meter square? I happened to catch part of Rush Limbaugh’s show today. He had a clip of Danny Glover (Detective Roger Murtaugh in Lethal Weapon) claiming the earthquake was a result of not just global warming, but the failure of the Copenhagen conference! Isn’t this a great world? We don’t need to study the sciences to figure out what is going on; just tune into one of our entertainers and they will tell us what to believe. David Letterman will be glad to help you out if you’re puzzled about world events. Remember in the old days comedians just cracked jokes and newspapers just reported the news and weathermen just tried to predict the local weather and no one was trying to save the world? I’m sure both organizations are up to the challenge of keeping temperatures warm. Globally, observed CO2 emissions, temperature and sea levels are rising faster than expected. The warming has been fastest over land, and greatest in the higher latitudes of the northern hemisphere. Global ocean temperature rose by 0.10 ºC between 1961 and 2003, to a depth of 700 metres. In Australia, there has been a 0.9 ºC warming since 1950. We have already observed changes to our climate that are more rapid than anything the earth has experienced for at least 1800 years. Well as a long time sceptic who has always felt that the landbased temps were unreliable and open to manipulation our mainstay of anti AGW hype has been the satellite data! Now what the heck is going on? There’s a Sea Surface option too on the AMSU. ‘Highest on record’ (after 2002). Did you also note the opposite decreasing Trend for the 25000ft – 7.5Km? since Jan 14th was warmer. I partly agree that this may not be too significant but the UAH November 2009 anomaly was the highest November anomaly on record and it looks likely that January 2010 will be the warmest January on record. I’m just wondering how many more records need to be broken before there is a realisation that the sun may not be as influential as some seem to think. I have sent you the link to this great website. I’m wondering how many times I’ll have to explain the post solar minimum modoki el nino to you before you stop making dumb statements like this one. I know you are intelligent enough to understand it, so maybe you are just being rhetorical. I am very naive when it comes to climate but this graph surprises me. If somebody had explained to me that the average temperature was calculated from readings taken all over the globe on each day of the year and then asked me what the graph of these averages would look like, I would have said a straight line. I would have reasoned that when the northern hemisphere is hot then the southern is cold and vice versa so that it all ends up cancelling out. This graph clearly show an annual rise and fall. Not only that but the values are so low. Could somebudy either enlighten me or point me in the direction of some explanation? It’s best advised not to write things like “warmest January on record” otherwise unscupulous warmists like the BBC are bound to take it out of context. We may know it only refers to 30-odd years of satellite readings and not 300 years of temperature records, but using a short-term record to imply “ever” is something they’ve done before (e.g. arctic ice) and no doubt will do again. I am very naive when it comes to climate but this graph surprises me. If somebody had explained to me that the average temperature was calculated from readings taken all over the globe on each day of the year and then asked me what the graph of these averages would look like, I would have said a straight line. The Earth has more continental mass in the northern hemisphere. This reradiates heat more readily than the oceans dominating the southern hemisphere. So even though the Earth is closer to the sun in Austral summer, the atmosphere gets warmer in N.H. summer. The data shows the same warming at high altitudes (46,000ft). That cannot be related to the greenhouse effect, which is at a lower altitude. I guess it must be solar-driven. Thank you so much for making this excellent Web-based plot-tool on the web for all to use, all over the globe. You know probably very well that as soon as you make something like that, people want more, and more…..
-Introduce a selection so we can see year by year (as is now) versus start until end. Of course 1998 until 2009 wil create a wide band of colour over the screen, so to get a trend one will need a running average. The running average value, e.g. 12 months should be adjustable. That will teach people why a running average us usefull, just as a visual tool to see trends. -Introduce a global (as is now) versus Hemispherical plot. One line for ,say -30 to +30 lathitude, one for +30 to +60 , one for +60 to +90, and same for Southern Hemisphere. With running average selection as well, and start until end. I agree with those saying effects from clode-cover is better called feedback, rather than forcing, and that the sun’s influence could be called external forcing… however, maybe “external input” would be even better? I provide links to various NASA, NOAA and UAH datasets and interactive maps and graphs. We have had a significant downturn in hurricanes lately. I suppose the warm oceans could be a side effect of limited heat release by hurricanes. The temperature variations are always expressed only as drybulb temperature variations. Wetbulb temperature variations are never discussed. Since AGW is really a discussion about HEAT at the Earth surface, if both are not known, how can we possibly know if heat at the Earth surface is rising or falling? It seems to me that a record of drybulb temperatures withouth wetbulb temperatures is a completely meaningless record (heat wise). In the middle of the year, it is summer in the NH, and winter in the SH, and vice versa. Land masses have greater range in temperature than oceans. There is much more land mass in the NH than in the SH. So the average temperature in the NH winter, will be colder than the SH winter, and the average temperature in the NH summer will be warmer than the average temperature in the SH summer. Your intuition that the hemispheric temperate ranges would counterbalance is incorrect because of the hugely disproportionate balance of land mass and oceans in the two hemispheres. and select the radio button for the “anomaly” view. You’ll see the blue (cold) over the US and continental Asia, but then look at the north polar region, and the southern oceans (not to mention the warm spot in Africa). The latter apparently are offsetting the former, so that the “average” is warmer than usual for this time of year, over the whole earth. So why is this “post solar minimum modoki el nino” much warmer that the others. Solar Cycle 23 wasn’t a particularly active cycle. Solar Cycle 19 was a big cycle why wasn’t there similar spike in the early 1960s. You’re just grabbing at straws. Increasing activity from SC24 will push temperatures up another ~0.1 deg over the next few years. Warm oceans? Since 2005 there has been a statistically insignificant decline in measurements taken to 2000m. You must mean SST. To some degree El Nino, La Nina are merely changing the surface pattern of relative anomalies. However they can indicate a overall change in the SST. , and they can raise or lowere land temperture. In fact they do this quite well. But warmer oceans, not happening. Did anyone respond. I have limited time. I suggest you smoke out Smokey, he has on hand numerous charts of every flavor to counter these alarmist claims, or to show there inconsequence, as some are. I see have seen no public evidence to suggest the data was tampered with, but even if it was, the data being presented doesn’t even support a warming conclusion. A single data point comparing one day this year versus one day last is meaningless. Further, the data being presented is the “near surface” channel which includes land masses. They may only account for 25% of the earth surface, but they suffer wild temperature swings over short time periods that are not indicative of over all global temperature or long term trend. Switch to the sea surface channel and look through the years one by one. 2003 appears to have been a high followed by stable or cooling years until warming resumed in 2007. Since there is no data before 2003 on that channel, one can draw no conclusions as to how long the cooling trend was in place. Even if one wants to look at the near surface channel only, the first 9 days of January 2010 were COOLER than the first nine of 2007. This isn’t about discrediting the data, it is about learning how to look at it in proper context so the while planet doesnt got into a tizzy over a single data point. But if you look at the explanation of the AMSU you will see that the channel 5 weighting function is pretty broad and has a finite value at ground surface, which means that surface emissivity in the microwave spectrum may, in fact, have some impact on the measurement. I do not know how the microwave emissivity of snow compares to vegetation or soil, so I have no feeling for what the effect of substantial snow cover might be. Interestingly we don’t see such concerns when similar headlines refer to ‘record’ cold! The very warm Arctic and Greenland shown in the TLT channel is particularly interesting. The air involved in the ferocious outflow southward in continental regions of the NH has been replaced with warm southerly flow over Alaska and Greenland heading poleward. I have watched the persistence of this flow day after day over Greenland and the Labrador Strait all through December and early January in the SSEC composite animation at the University of Wisconsin. I wonder if there has been unusually heavy snowfall in Greenland and/or islands in the Canadian Arctic? I’m not denying statistical issues entirely. There are two sources of “standard deviation” in the global temperature data set: a standard deviation from averaging the temperature at a given point in time (spatial variation), and the standard deviation over time. I’ve long wondered if the error bars we sometimes see around the global mean plotted over time take both of these into account, or just the spatial distribution at each point in time. I think they are focused on the latter, but I’m not sure. Still, I think the notion of a statistical mean global temperature, as a statistical metric, is not per se invalid, and is certainly not invalidated by the greater volatility of local temperature variation, any more than the greater standard deviation of a single stock invalidates the use of a stock market index to track movements in stock markets. That is a red herring argument. There may be valid questions to raise about how we measure the standard deviation of a global temperature metric, but that was not the basis of Luboš argument. I’m not persuaded that his argument has merit. But Anna we’re talking about the emissivity of molecular oxygen at a variety of frequencies from 50-60 GHz if you want to talk about the uncertainties talk about the quantities actually being measured. The microwave frequencies chosen are used because they aren’t effected by clouds like IR is. Ice does interfere though which is why RSS doesn’t report TLT outside 70ºS-82.5ºN. Even numbered solar cycles tend to be associated with epochs of cooling. As the cycle ramps up, the rate of cooling declines, but not enough to translate into a warming of the degree you expect. Look at it this way. We’re supposedly in a negative phase of the PDO, but that doesn’t eliminate the warming influence of El Nino’s entirely, it just moderates their warming influence. In the same way, the ramping up of a solar cycle may moderate the cooling influence of a PDO, but not necessarily enough to translate into positive warming, just a reduction in the rate of cooling. Climate is nothing, if not messy. For a good perspective on the CO2 emitted by human activities: click. Add in enough selected parameters and you can show just about anything. The chart above is from satellite data – the most accurate global temperature measurements. There is no credible basis for that statement. It references computer climate models, which cannot accurately predict temperatures: click. The statement comes from the UN’s IPCC, written by its 100% political appointees, who would be replaced if they admitted that there is no empirical evidence supporting that statement [empirical = real world, unadjusted raw data]. As we can see, there is nothing unusual going on. The climate naturally fluctuates. The current climate is very benign by historical standards. CO2 is rising, but 95%+ of the rise has nothing to do with human activity. CO2 may have a slight effect on temperature, but it is insignificant; many other factors have a greater effect. If that were not so, then the continuing rise in CO2 would be causing the global temperature to rise: click. I trust that those charts will help you to counter the disinformation used by climate alarmists. If you need more, ask. And if you follow this site for just a few weeks, you will see that the enormous amounts of money granted to scientists who promote the AGW hypothesis have corrupted climate science. For more detailed information on the corruption of government/university climate science, see the comments under the “Climategate” tab at the top of the page. Smokey’s comment above (10:42) is an example of going to the other extreme. Which isn’t advisable in my opinion. While it is true that the CO2 hypothesis has been over-hyped it isn’t completely implausible and without merit as a hypothesis. And not all the scientists who believe in CO2 driven climate catastrophe are intellectually corrupted. Just a few them at the top. Pointless antagonism won’t be fruitful for the debate. Everyone should follow McIntyre’s example in this. True it isn’t looking good for the CO2 hypothesis at the moment, but let us not forget that it has not been disproven either. We should be able to know much better by 2020, and I don’t think there is any justified basis for multi trillion dollar investments in renewables before then. But still it is a valid hypothesis to keep in mind if temperatures keep raising. I wasn’t being antagonistic. val majkus asked us for information to counter the alarmist talking points he was hearing. If you have better information than what I provided, then by all means, post it here. And if you believe that the information provided is ‘extreme,’ please show me where. I was not trying to be extreme; I was simply countering the misinformation we see everywhere: sea levels are not rising faster than expected. Quite the opposite. And CO2 has no measurable effect on global temperatures. As I explained, the effect of CO2 is not significant, meaning that it will not lead to runaway global warming. The deep ocean is cooling, not warming. And the global temperature is well within its long term natural parameters. That’s a good point. In a matter of years we should have results from the cloud experiment and more measurements of the Earth’s radiative balance. We will have a longer sea level and heat content record. We will probably have the surface instrument record re-processed to give us as good a record as is possible with sparse and changing thermometers. Just another 5 – 10 years will give us a clearer picture of the situation. The most important thing about the climate of the future is not so much to accurately predict it but for humanity to thrive in it. And, within likely limits, thriving depends far more upon the powers of human adaptation and invention, upon the free commerce of free peoples, than the tax-funded prophecies of the hierarchy of the Church of Science Alarmist and End of Days Saints. anna: “As to the emissivity of the atmosphere , ( the percentage difference from black body) the gray body constant of air which can be calculated as in formula 8 in link and is temperature dependent: for 10C it is 0.74, at 20C it is 0.79. for 30C it is 0.85 introducing more errors. At these microwave frequencies, the intensity of thermally-emitted radiation measured by the instrument is directly proportional to the temperature of the oxygen molecules. I see that my objections are for translating temperature into energies, and in the satellite case only the atmospheric emissivity would play a role in errors in energy determination. You are right,for the plot in this posting, I should be asking to see the errors coming from corresponding the microwave lines to temperature. I think an anomaly of 0.7°c is almost impossible, it will be around 0.4-0.45 wrt 1979-1998, slightly cooler than last November and significantly warmer than December. Thank you for all those that have responded to my plea for an explanation of my lack of understanding. The land mass distribution makes perfeect sense. So, it’s on to data sets and channel 5 weighting functions next. If you don’t like the tone of his posts (and it really is not bad at all), then go back and look at the content. Hell…a little “extreme” is good for the soul….extreme weather, extreme sports, etc. Separates the wheat from the chaff and thins the herd. Milk-toast mediocrity, cajones-clipped pundits, and “political newspeak” is killing this world today. Sometimes the only way to say it is to say it. You wanna talk “extreme”? Here’s a good one. But also darkly funny. I think it’s pretty obvious that the NH is having a coldish winter. For the SH to not just cancel that, but exceed it by enough to make it a record high beggars belief. That would mean the SH was seeing not just highs, but super-hot days. As I live in the SH (NZ) I am surprised that we aren’t seeing that. It may be scientifically accurate, but I’m struggling to find it even remotely plausible. So even though the Earth is closer to the sun in Austral summer, the atmosphere gets warmer in N.H. summer. I know many (perhaps most) people believe that summer is caused because the “earth is closer to the sun” but, really, on this site we should be able to do a bit better than that! The SH and NH are the same distance from the sun, and a moment’s reflection will make that obvious. It is the angle of inclination which causes the seasons. Two things I think you are missing. First, and perhaps most important, is that we’re discussing deviations from a baseline (“anomalies”) not absolute temperatures. So we’re not saying that the SH summer is offsetting the NH winter in absolute terms, but only “relative” to some baseline (1979-1998, I think, for the satellite data). I.e., the SH is “relatively” warmer than the NH is “relatively” colder. Second, the offsetting warmth in the SH is mostly in the oceans, so you may not be experiencing it directly in NZ. and select the anomaly view, and look at all the red and yellow. Look at all the blue and purple, too. But the latter is concentrated…where people live, so it naturally gets all the headlines. It is an extreme position to claim that 95% of the rise in atmospheric CO2 would have got nothing to do with human acticity – you won’t get many skeptics to agree with you on that. I think Smokey is simply mixing total (cyclical) CO2 output with raise in CO2 levels. And it is an extreme position to claim that government funded climate science in general would be corrupted and that IPCC would be 100% political. You cannot generalise from the rotten behavior of a few known suspects. And while IPCC is politicized it is not thoroughly so. And it is an extreme position to claim that CO2 as a climate forcing would be insignificant. I think most established skeptics like Lindzen, Spencer and Pielke consider climate sensitivity to be around 1C, while IPCC consider it to be around 2.5C. 1C, while definitely not catastrophic, is significant. But not significant enough to warrant trillion dollar extra investments to fix the “problem” in a world with so many other, more urgent challenges. And that is the key question in the debate between consensus and skeptics. With the data now slowly and inevitably becoming available, skeptics and consensus should seek to co-operate so that science, and not politicization, can satisfyingly decide the issue during the next 10 or so years. The next IPCC process is guaranteed to be lot more transparent than the previous ones, Jones and Mann are bound to be relegated to bit part players. In short my point is that further antagonism is not needed this moment in time, and it is better to wait and see how things develop, to remain open minded on the key question and seek common ground to research it. Personally I’m confident that it is in the field of science that skeptics will eventually win the debate. Speaking of UAH, when is their hockey team going to get its act together? They perform very well when up against top teams, but against everyone else they’re rather embarrassing. Where I live in Oz (lat 34.35 deg. south) is about 80 kms. from Sydney. Typically, our temps. range from 2-4 deg. (C) cooler. This has been one of the cooler festive seasons that I can recall in my 60+ years. The weather channel is predicting more cooler weather to come for this locality over the next ten days. Not complaining, can’t stand hot, humid weather anyways. Sure, Melbourne and Adelaide in particular are having a “horror stretch” but that’s nothing really new for them. Hot air from the parched centre is forced south in a generally predictable pattern every year. I agree with much of what you say. But it should be kept in mind that all the skeptic side has been doing is asking questions and requesting information. It is the alarmist side that plays dirty. Your expectation that the IPCC will become transparent is a triumph of hope over experience. This is about a major transfer of wealth disguised as saving humanity. It is based on scaring people with a non-problem. I don’t think those trillion dollar bills dancing in the eyes of the international scam artists who infest the UN will go away simply because the CRU and Michael Mann have been caught gaming the system. They will just be more careful. But transparent? No. They will not do anything to upset their financial game plan. I posted those charts upthread in case anyone was interested. The one from the IPCC shows that for every ≈34 molecules of CO2 emitted annually, only one is emitted as a result of human activity. All the rest are natural emissions. Those are the UN’s AR-1 figures, not mine. I provided that citation, and you responded with your opinion. Can you provide any solid, real world, testable evidence, showing that the approximate one-third rise in CO2 is expressly due to human activity? It may well be that humans are the cause. But I’m a skeptic, and I don’t accept the endlessly repeated argumentum ad ignorantiam, which claims that the rise must be due to human activity — simply because that conjecture has not been proven false. There are other possible reasons for the increase. In the geologic past, CO2 levels have been many times higher, when humans could not possibly have been the cause. The total amount of CO2 emitted by humans is well within the natural year-over-year fluctuations of the planet’s total emissions. In other words, the amount of human produced CO2 is down in the noise: one part in 34. If I take someone’s word that the one-third rise in CO2 must be due to human activity, rather than, for example, outgassing from a warming ocean, then I might as well take that person’s word for anything at all, and open my wallet. We also disagree regarding the politicization of the IPCC. The IPCC policy makers are completely political. They have their marching orders. They receive their tax free pay from the UN, plus numerous other perqs, including expense accounts and international travel. Individuals in that relatively small group of policy makers are appointed by their political masters, and they can be replaced just as easily. There are always many more candidates for those jobs than openings. The basis for my statement that the positions are political is that they are political appointees. How could they not be political? We will just have to disagree on that point. Next, by quoting the upper range Prof Lindzen’s climate sensitivity, and then the IPCC’s lower range, you make it appear that they are close to agreement. They are not. Further, in every IPCC Assessment Report, they have significantly reduced their sensitivity number. It is still too high. Climate sensitivity to CO2 must be very low. How do we know this? Because the planet is telling us: as CO2 continues to rise, the temperature does not follow. There is ample evidence that CO2 rises following a rise in temperature, therefore it is an effect of warming, not a cause. You say “it is better to wait and see how things develop,” and I agree. There is no urgency. The longer we put off taking unnecessary action, the more obvious it will be that the whole CO2=CAGW hypothesis is a financial scam — the biggest financial scam the world has ever seen. Posts like this get skeptics derided by warmists. Anthony, you’ve built this site up with quality posts that confront the issues that seem to get ignored by warmists. If this is the best response to a single graph of preliminary data over a few days, count me as a warmist. You might have been right if the governments of the west were not still full steam ahead for carbon nonsense. Give me a link for a pronouncement from the relevant minister of a western country that is not pro sequestration, cap and trade etc. based on “the science is settled”. In contrast to you I think the skeptics and particularly the skeptical climate scientists have to keep on shouting, and they need the general skeptical public’s support, scientists and laymen. It is urgent that decisions are put off for a few decades in order not to destroy western civilization as we know it, and this will not happen by being nice nice with the “hiding the decline” scientific side. I understand that the UAH values don’t reflect conditions on the ground in a particular area. So we are freezing (not today) in the Northeast yet UAH values are above normal because elsewhere on planet earth it is above normal, Duh, not sure that deserved a post. However, I assume the UAH values over time have value in assessing global temperature. 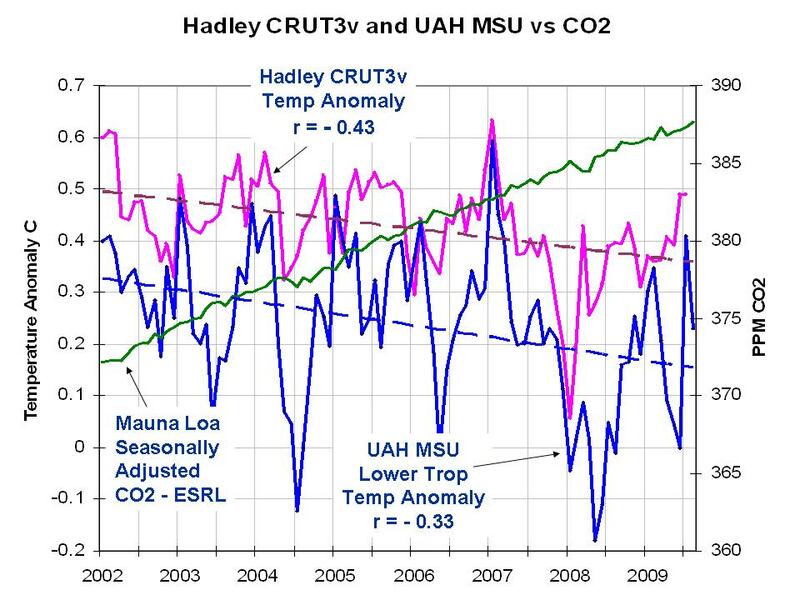 The fact that UAH has been flat/declining over the last decade in the face of increasing CO2 is not consistent with AGW. I assume that during the Medieval Warm period, the global T at 14,000 ft was above “normal” and that during an Ice Age, it is below “normal”; otherwise, why the hell are we measuring it. I like’d to understand why the UAH T is at 20 year record highs. We just went through an extended solar min; and various solar indices are low, why aren’t UAH T lower? Can Anthony please provide a legend for the various colours and tell us which of those the little 2010 January segment (LHS of graph) represents? It might also be nice to know what the other plots have been doing 2010 during the January stealth heat snap. I’m now guessing that the other plots are for several previous years. If so, my bad. Is this step increase in temperatures going to be repeated? I like to go to that site when I’m in the mood to go toe-to-toe with Alarmists. In particular, there is one Alarmist who calls himself “Brookline Tom,” and he and I have been debating for over four years now. He remains a true-blue and faithful supporter of Hansen, but after four years of bickering I can’t help but like the fellow. The other person mentioned in my comment is Brett Anderson, who runs the site and also is the Accuweather blogger-forecaster for Eastern Canada. Rather than investigated, Mann gets a half million in stimulus money. Poor Brett. I’ll bet you could use a half million of stimulation, but do you get even a red cent from the government? Nope. Instead you have to pay them taxes. Tain’t fair! I could go into quite a rant, but I would only annoy my good buddy Brookline Tom, so I won’t go there. Instead I’ll give Brookline Tom some news that likely will have Alarmists jumping for joy. The UAH satellite data showed a fascinating spike in world temperatures at the start of January. They went from around +.2 to +.7, which is up past the levels reached by the 1998 El Nino. However the fact that air temperatures can fluctuate to such a huge degree in only a couple weeks creates doubt as to whether they are a reliable measure of how “warm” the planet is. They likely are a measure of other things. They may be a measure of how much heat the oceans are shedding, or even a measure of how much heat the planet is giving up to outer space. Melting ice and then vaporizing the resultant water takes heat, and that heat is then stored as latent heat in the molecules of water vapor. Then, when the water vapor condenses, and then freezes to snowflakes, all that latent heat is released, and returned to the system. Therefore the creation of a huge snow-cover releases heat, but melting that snow-cover will use up that heat. This may in part explain the spike in world temperatures over a period of just a few weeks. In any case, all the needed research on the earth’s energy-budget can be done using satellite data as opposed to surface stations. The surface station data is too “adjusted” (fudged) to be much use, and our tax-dollars are better spent on satellites than on tweaking the temperature data from, for example, 1889. Surface station data is very important to hard working forecasters of daily weather like Brett, but in terms of so-called “Climate Science,” there are much more interesting things we should be studying. It now looks increasingly likely that we’re seeing something similar to the 2008 Super El Niño. This is a bit premature. So far, what we’re seeing is more like the 2002 El Nino. The latest ONI is 1.5, which is what it got to in 2002. This one may rise a bit more yet, but is still far short of the 2.5 seen in the 1997-98 “Super” El Nino. Tomorrow’s ENSO evolution report should be interesting, to see if it suggests that this El Nino has further to go. This past week’s CFS ensemble showed the current El Nino at a peak, and forecasts were down from the present figure. Crappy graphics-is that hot spot minus 4 or plus 8 by the color indicators? Or maybe I’m just color blind. Crappy, indeed. It is bad form to repeat the contour colors. The very lowest temperatures appear where cold air has been flowing off the continents, so the alleged -8 must be off the U.S. east coast, or in the Skagerrak, but too small a region to resolve at this scale. I’m pretty sure the people involved with the MSU satellites would have already thought of this, but is any else here familiar with AAS/AES? I hope so, because I simply don’t have the time or patience to go into a full explanation. It sounds counter-intuitive, but there are instances in spectroscopy when line-specific emissions can increase at the same time that total energy input to the system is decreasing (and vice versa). Hint: think about a 1% drop in TSI, but 6% drop in UV wavelengths? I don’t know how accurate those numbers are but they make sense in context. No, you are not wrong. The wetbulb would actually give us the enthalpy of the air rather than just its temperature. However, drybulb temperature is what drives LW radiation and so is closely related to the concept of equilibrium; wetbulb is more difficult to measure, and generally less accurate; the COOP stations do not measure this routinely (I think); and if humidity of the air remains constant (I doubt it does) then enthalpy is approximately proportional to temperature anyway. You can see from reading this site that temperature alone is difficult to measure accurately. I suspect that trying to reach the point of mapping enthalpy would reduce the whole exercise to chaos without adding enough to the discussion to be worth the effort. No Smokey is looking at the actual numbers on the chart from the US Department of Energy and doing the arithmetic. Human CO2 is 2.9126% of the total. Smokey is not being “extreme” I suggest you take a look at the climategate discussions or better yet Hansen’s never ending “adjustments” to the US temp data. Before you start criticizing someone, LOOK at the information he has given first. It saves getting egg on the face. Like I said skeptical suicide! Please no more of these posts. Well it looks like I’m right. Diving back to 2009, nice warm spell.